Since last summer, we have been assisting 52 of our OneCity Health primary care partner sites to achieve Patient-Centered Medical Home (PCMH) recognition to ensure that New Yorkers have access to high-quality primary care. Similarly, over the past year, NYC Health + Hospitals, our largest partner, has been on a journey with 32 of its primary care facilities to renew their Level 3 PCMH status, which is the highest level of recognition conferred by the National Committee for Quality Assurance (NCQA). As our primary care partner sites continue their certification process, the work completed at NYC Health + Hospitals demonstrates the ultimate value of these efforts, both in improved care for patients and a significant return on investment. Achieving PCMH recognition does not mean construction of a physical space; instead, it is a care model that emphasizes patient-centered access, improved care coordination and enhanced communication. Rather than a patient feeling that his or her care is fragmented, the PCMH model supports patients and families/caregivers in self-management and shared decision making. First, to improve access for patients, NYC Health + Hospitals launched centralized, borough-based call centers to help patients more easily schedule appointments across the system. Next, it enhanced convenience for patients to access primary care. “For continuity of care, patients can now access their primary care provider (PCP) by phone for appropriate follow-up care without needing to take time off from work or spend money on transportation to visit one of our practices,” said Rebecca Miller, Director, Primary Care Transformation, NYC Health + Hospitals. NYC Health + Hospitals’ work toward achieving PCMH certification has not only improved patient care, but has also increased revenue. Following PCMH certification, the New York State Department of Health (NYSDOH) provides incentive payments for certain patient populations, including Medicaid Managed Care (MMC) and Medicaid Fee-for-Service (FFS). After accounting for expenditures such as those made to the NCQA and staff time devoted to the recognition process, NYC Health + Hospitals determined that achieving PCMH certification led to net revenue of $18.3M for fiscal year 2015 and $16.8M for fiscal year 2016. 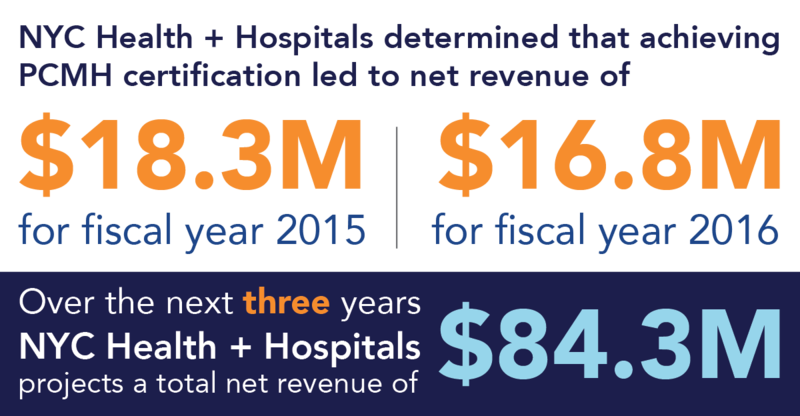 Moreover, due to increased payment rates from the NYSDOH under the Level 3 2014 PCMH certification standards, NYC Health + Hospitals projects a total net revenue of $84.3M over the next three years (FY’17-FY’19). OneCity Health is continuing its investment of $1.8M in primary care transformation for our network, not including NYC Health + Hospitals. As NYC Health + Hospitals demonstrates though, our investment in the patient-centered medical home model can yield significantly more revenue for our partners, as well as drive transformation in patient care and improve coordination throughout our developing integrated delivery system.